Emeasor, K. C.* and Nwosu, U. Department of Plant Health Management, College of Crop and Soil Sciences, Michael Okpara University of Agriculture, Umudike, Abia State, Nigeria. *To whom correspondence should be addressed. E-mail: kingsleychidiemeasor@yahoo.com. Received 28 May, 2018; Received in revised form 16 July, 2018; Accepted 19 July, 2018. Cowpea, Insect pests, Plant extracts, Cypermethrin. Cowpea, Vigna unguiculata is a staple food crop of significant economic importance to man and animals in terms of its proteinous content supply. Every phenological stage in the life cycle of cowpea has at least one major insect pest. This research work was carried out to determine the effects of spraying botanical extracts (Gmelina arborea, Ageratum conyzoides, Carica papaya, Vernonia amygdalina) and the synthetic insecticide (Cypermethrin) in the control of these key pests of cowpea. The study was conducted at the Michael Okpara University of Agriculture, Umudike Teaching and Research Farm Umudike, Abia State. The experiment was laid out as a 6×2 Factorial in Randomized Complete Block Design (RCBD) with six treatments which were applied once a week and once in two weeks and replicated three times in 2014 and 2015 cropping seasons. Data were subjected to Analysis of Variance (ANOVA) and significant means were separated by Fisher’s Least Significant Difference Test (LSD) at 5% level of significance. 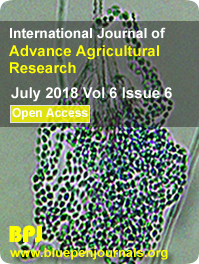 Results from this study clearly showed that the plant extracts used did not significantly reduce aphids population in 2015 but effectively controlled M. sjostedti population and M. vitrata damage in the two cropping seasons. The population of pod sucking bugs was also reduced. Grain yields were significantly higher (p<0.05) in 2014 than in 2015 cropping seasons. The implication of this result is that major insect pests of cowpea in the field can be effectively controlled using plant extracts applied once a week. Application of these plant extracts effectively reduced the population of the insects, reduced damage and increased yield.